Hi everyone! Well, we're back from vacation and feeling a little exhausted and definitely bummed that it's over, but we had an amazing trip that I'll be sharing more about in an upcoming post. In the meantime, did you see Monday's post with Thriving Home? Can you even believe that this adorable and cozy poncho I shared on Insta came from Amazon of all places?! While today is not an Amazon-themed post, the dress I want to share IS a total steal right now and would make the perfect addition to anyone's closet. I particularly love this dress for an office job where the dress code is more business casual but it would also be great for church or a night out with your girlfriends or significant other. And aren't the ruffles just the sweetest little detail? They've been such a trend all season and I absolutely love how they add a feminine touch to something without being too over the top. This dress is super flattering and like I said, I think it's great for so many occasions. It would be easy to dress it up or make it more casual based on the shoes and accessories you choose. This cute little number is currently 50% off (making it less than $30!) so if you're looking to add a versatile piece to your closet like this one, there is truly no better time. 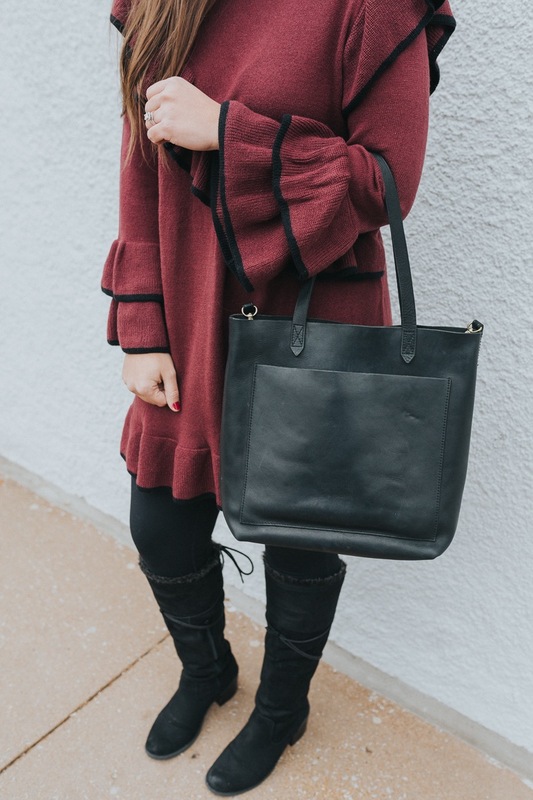 I picked it up on sale at Nordstrom a few weeks ago and have loved the handful of times I've already worn it! Happy shopping and an even happier Wednesday to ya!